A difference plot shows the differences in measurements between two methods, and any relationship between the differences and true values. Bland and Altman (1983) popularized the use of the difference plot for assessing agreement between two methods. Although their use was to show the limits of agreement between two methods, the plot is also widely used for assessing the average bias (average difference) between two methods. The classic difference plot shows the difference between the methods on the vertical axis, against the best estimate of the true value on the horizontal axis. When one method is a reference method, it is used as the best estimate of the true value and plotted on the horizontal axis (Krouwer, 2008) . In other cases, using the average of the methods as the best estimate of the true value, to avoid an artificial relationship between the difference and magnitude (Bland & Altman, 1995) . A relative difference plot (Pollock et al., 1993) shows the relative differences on the vertical axis, against the best estimate of the true value on the horizontal axis. It is useful when the methods show variability related to increasing magnitude, that is where the points on a difference plot form a band starting narrow and becoming wider as X increases. Another alternative is to plot the ratio of the methods on the vertical axis, against the best estimate of the true value on the horizontal axis. Altman, D. G., & Bland, J. M. (1983). Measurement in medicine: the analysis of method comparison studies. The statistician, 307-317. Bland, J., & Altman, D. (1986). Statistical methods for assessing agreement between two methods of clinical measurement. The Lancet, 327(8476), 307-310. Bland, J. M., & Altman, D. G. (1999). Measuring agreement in method comparison studies. Statistical methods in medical research, 8(2), 135-160. Carstensen, B. (2011). Comparing clinical measurement methods: a practical guide. John Wiley & Sons. Pollock, M. A., Jefferson, S. G., Kane, J. W., Lomax, K., MacKinnon, G., & Winnard, C. B. (1992). Method comparison - a different approach. Annals of clinical biochemistry, 29, 556-560. Bland, J. M., & Altman, D. G. (1995). 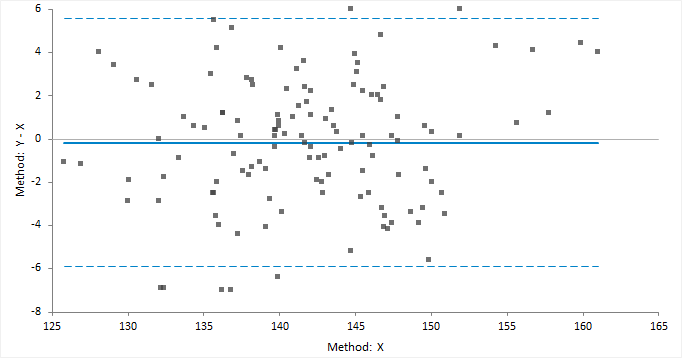 Comparing methods of measurement: why plotting difference against standard method is misleading. The Lancet, 346(8982), 1085-1087. Krouwer, J. S. (2008). Why Bland–Altman plots should use X, not (Y+ X)/2 when X is a reference method. Statistics in Medicine, 27(5), 778-780.